Compilatie rond hedendaagse folk in Vlaanderen op initiatief van Muziekcentrum Vlaanderen in samenwerking met Muziekmozaïek ter promotie van muziek uit Vlaanderen in België en het buitenland. The selection of near 74 minutes is well compiled to a perfect listen, shows also pretty much two sorts of approaches. Two third of the groups are rooted in rural Flemish traditional folk, but they expanded this with experience so that a certain dynamics gives this again a contemporary feeling. Many of these groups except for a few private or small label contemporaries are related with the Apple/Wild Boar label who support such groups, also on most of the folk festivals in Flanders. A third or so other part are more independent, adventurous and creative and classically educated, often are also the more urban contemporary folk styles, supported by a label like Homerecords. The rural bands clearly have common ground in styles, as if all being the same band with lots of different ideas. Hearing these tracks compiled like this it works pretty well, as a perfect listening CD. 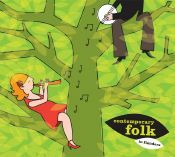 ..As a presentation to potentional promoters this album gives a realistic perspective what Flanders contemporary folk has to offer.